Gastroscopy is a procedure that lets doctors see inside your stomach and small intestine. In a gastroscopy, a small, flexible tube is passed into your mouth, down your throat and food pipe (oesophagus) and into your stomach and small intestine. The tube (called an endoscope) is about the width of a little finger. It has a tiny video camera at the end, which allows doctors to see inside your oesophagus, stomach, and first part of your small intestine. The doctor can also take small samples of tissue if necessary. A gastroscopy is done in hospital, but you can usually go home the same day. You don't need to have a general anaesthetic, but you can have a sedative to help you relax and reduce discomfort. Information about gastroscopy at Christchurch Hospital, and how to prepare for one. 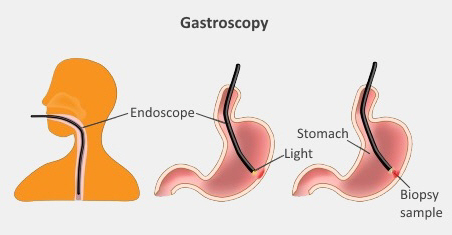 Information about gastroscopy, a procedure where an endoscope (a long thin flexible tube with a video camera at the tip) is passed through your mouth into your throat, stomach and first part of your small bowel. Information about capsule endoscopy, where you swallow a small capsule containing a video camera so doctors can examine the inside of your small bowel. This video provides detailed information on what gastroscopy involves. It also shows what the endoscope looks like. The video is around 2 minutes.